From the moment I was old enough to form and vocalize opinions, I was stridently anti-vegetables. I took issue with their texture, but mostly I was pissed that the tomatoes on my plate were assertive and drippy enough to make everything else taste just like them. I maintained the vegetable ban throughout my childhood and remained on high alert to fend off attempts to conceal these food traitors inside more acceptable dishes. The only vegetables to escape my childhood ire were humble ones that didn’t impose their will and juices upon their neighbors: vegetables such as lettuce, celery, and carrots. Until my palate evolved, these were my ride-or-dies, the only three ingredients to grace my sad salads. 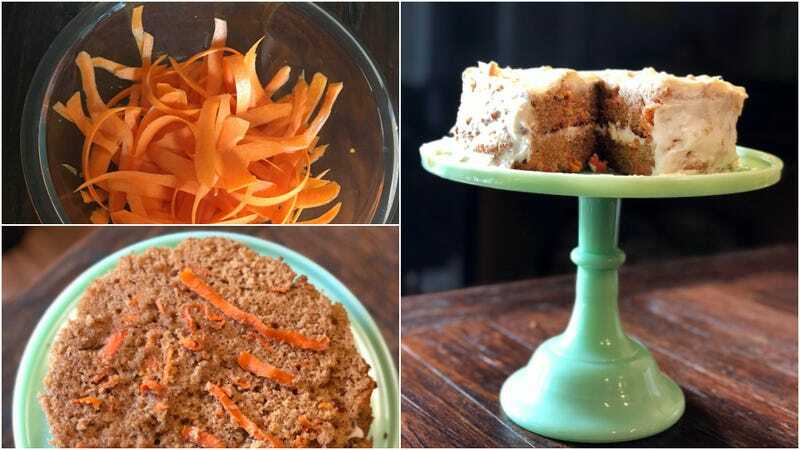 For a vegetable-hating kid, carrot cake presented the ultimate dessert paradox. Carrot cake is a baked good whose signature ingredient is a vegetable, which means it should be regarded with the utmost suspicion. On the other hand, cake is cake, and cake should be eaten, full stop. Eventually, sugar addiction beat out vegetable aversion, and I tried and liked the cake. Baking is a science and like most sciences, the best results come from failed experiments (hello penicillin!). My favorite mis-bake happened in May, as I prepared a carrot cake for a Memorial Day barbecue. In a moment of complete stupidity—or genius, you decide—I peeled rather than grated the carrots. I didn’t notice the error until I pulled the pans out of the oven and discovered that instead of evenly distributed carrot shards, each slice was veined with long, whimsical orange ribbons. The cake looked and smelled amazing, but I was convinced the strands made it too weird to eat. Panicked, I texted two friends who assured me the cake was fine and to bring it to the party where everyone would likely be too drunk to notice anyway. I agreed to bring the cake, but in the spirit of scientific discovery, made another one following the prescribed recipe. After presenting both the peeled and grated versions to my willing taste-testers, it was determined that the peeled cake was the superior of the two. I’m sure novelty accounted for some of the enjoyment, but the peeled cake also won over the grated cake for textural quality. Somehow, the carrot tendrils helped to evenly distribute moisture throughout the cake and from an aesthetic perspective, they look charming as hell. The trick with making this cake is to wait to add the carrot peels until the batter has been split between the two pans. This ensures the vegetables are evenly disbursed between the two cake halves and helps the baker control the cake’s marbling. I also found that stirring lightly after adding each dry ingredient helps to bring out the cake’s sweet and spicy undertones. From a timing standpoint, it takes longer to peel the carrots than it does to grate them with a food processor. But you save time by not having to clean the food processor, so I consider it time well spent. Like granola or frozen yogurt, carrot cake is a treat that sounds healthy but is actually the opposite. As such, I refuse to decorate mine with nuts, raisins, or any other pseudo-healthy adornments. Cake is sugar bread and I will not sully mine with unnecessary nutrients. Carrot cake isn’t always the go-to dish for parties and potlucks, but this recipe should be. It’s light enough to enjoy during the summer, provided you eat it relatively soon after serving so the cream cheese frosting doesn’t melt. The flavor profile is perfect for fall, and you better believe I’ll be bringing one or two of these bad boys to my Thanksgiving dinner this year. Most importantly, this cake is a nice reminder that palates evolve and mistakes happen. And sometimes, if you’re lucky, those mistakes taste delicious. Preheat oven to 350 degrees Fahrenheit. Line two 9-inch round cake pans with aluminum foil, then lightly coat with non-stick cooking spray. Combine flour, baking powder, baking soda, cinnamon, ginger, nutmeg, pumpkin pie spice, and salt in a large mixing bowl, stirring between each ingredient. Set aside. In a separate bowl, combine the oil, eggs, brown sugar, granulated sugar, applesauce, and vanilla extract. Add the wet ingredients to the dry ingredients, then mix thoroughly. Distribute evenly between the two cake pans. Add the peeled carrots to the two cakes pans, then stir lightly to redistribute the ribbons. Bake at 350 degrees for 30 minutes or until the cakes are lightly browned. Remove from oven and cool for 20-25 minutes before leveling and icing. Whip butter with a hand-held mixer until smooth. Add cream cheese and mix thoroughly. Add powdered sugar and vanilla and stir until mixture is suitably combined. Ice cake and garnish with star anise before serving.